Her Dream. : Happy Birthday to my dear sis! She has a cheerful personality. Yes, a typical HAPPY GO LUCKY TYPE girl! Of course, she has her downsides too. She is kind of stubborn, that's why she ALWAYS QUARREL WITH MY BROTHER. What's more scary is, she SLEEP-TALKING in the midnight, which freaks me out all the time. But all these 'stuffs', make part of her. She is the only one, that qualifies to be my sister. Only me can TAHAN her, and only she can TAHAN my style. We did have a simple birthday celebration with family just now. Daddy bought her a pair of Converse shoes while I bought her a pair of Nichii high heels. Glad that she loves the presents very much. Once again, Happy Birthday to you, my dear sister! 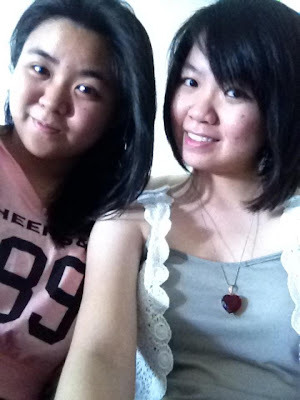 She's so lucky to have a sister like you (: Happy birthday again, Xue Wern! Happy birthday to your dear sister! Have a blast! Happy Birthday to Xue Wern! !